Great everyday poker set. 500 x 11.5g clay like poker chips with metal insert for just €59.95. Includes Aluminium Case, 2 decks basic cards, Dealer button & 500 chips. Colours may vary from picture displayed. Great everyday poker set. 300 x 11.5g clay like poker chips with metal insert for just €34.95. Includes Aluminium Case, 2 decks basic cards, Dealer button & 300 chips. Beautiffuly presented poker set with 300 Bicycle brand chips in wood box. 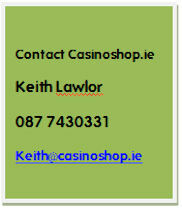 At casinoshop.ie we can customise chips to cater for all the special occassions. Colour labels are priced on request. 2 Decks of standard playing cards.